These are the most annoying words, according to a poll. 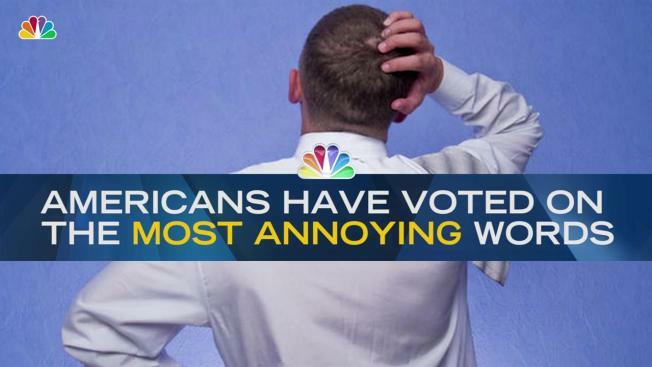 There is one word so apparently reviled by Americans that it has been named the "most annoying" -- out of all the words and phrases there are in casual conversation -- for nine straight years. According to a Marist Poll out Monday, that word -- the word you may want to avoid using at family or friends' holiday gatherings -- is "whatever." That said, it's not quite as hated as it has been in years past -- probably at least in part because of the millennial impact. Marist says 33 percent of Americans, down from 38 percent last year, consider "whatever" to be the most annoying word or phrase, but people younger than 45 aren't as perturbed by it as are their older counterparts. "Fake news" comes in second, with 23 percent finding it the most annoying, followed by "no offense, but" (20 percent), "literally (11 percent) and "you know what I mean" (10 percent). There was some variation along political lines. Of Independents, Republicans and Democrats, Independents hated "whatever" most (35 percent), while Democrats were most bothered by "fake news" (29 percent). It also varied by location -- respondents in the northeast, for example, were much more annoyed by "whatever" (38 percent) compared with their regional counterparts, but had less of an issue with "literally." The results of based on a national sample of 1,074 adults surveyed by phone between Nov. 6 and Nov. 9. Click here for the complete methodology and findings.